"Doping for Glory: The Roger Federer Story" Episode 4: After Roddick humiliates himself at the World Tour Finals media day, he reveals to Roger that he is freaking out because he knows Rafa is going to double bagel him, and Roddick was drawn to be Rafa's first victim. Roger is also beginning to question whether his illicit doping scheme is good enough to get him past Rafa. Since Stan didn't qualify, the two of them must form an evil alliance at the O2 to have any chance of preventing Rafa from destroying their fragile megalomaniacal universe. Ah, blog is back. Already missed the entertainment. "Satire" is primarily a literary genre or form, although in practice it can also be found in the graphic and performing arts. In satire, vices, follies, abuses, and shortcomings are held up to ridicule, ideally with the intent of shaming individuals, and society itself, into improvement. Although satire is usually meant to be funny, its greater purpose is constructive social criticism, using wit as a weapon. A common feature of satire is strong irony or sarcasm—"in satire, irony is militant"—but parody, burlesque, exaggeration, juxtaposition, comparison, analogy, and double entendre are all frequently used in satirical speech and writing. This "militant" irony or sarcasm often professes to approve (or at least accept as natural) the very things the satirist wishes to attack. Satire is nowadays found in many artistic forms of expression, including literature, plays, commentary, and media such as lyrics. Roger's drug and fashion abuses are no laughing matter! We won't be able to help him if it's covered up. We need to help him to get clean and to stop testing positive for spandex. What is Roger's Favorite Doping Choice? "Of course the physical nature of Federer did not help. For years everyone did a face with a knowing look when looking at the huge calves the man from Switzerland was displaying at the entrance of the court. It was alleged that he proudly showed off those calves to intimidate the adversary at the toss. 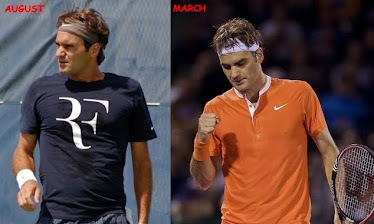 Tennis is a game based primarily on speed and leg drive at the moment of ball impact, it is clear in any case that there was an explosion of muscular calves for Federer in his junior year, and its arrival on the senior circuit had been written a lot of ink. Angered by the atmosphere of suspicion fueled by journalists, the world's No. 1 had also ended up cracking at a press conference, and became famous for the constant nastiness swung towards his great rival of the moment, "Nadal has bigger calves than me, but ask yourself why he wears cropped trousers." Travel theme. Theme images by lucato. Powered by Blogger.